Check out our gallery of optional backgrounds below. 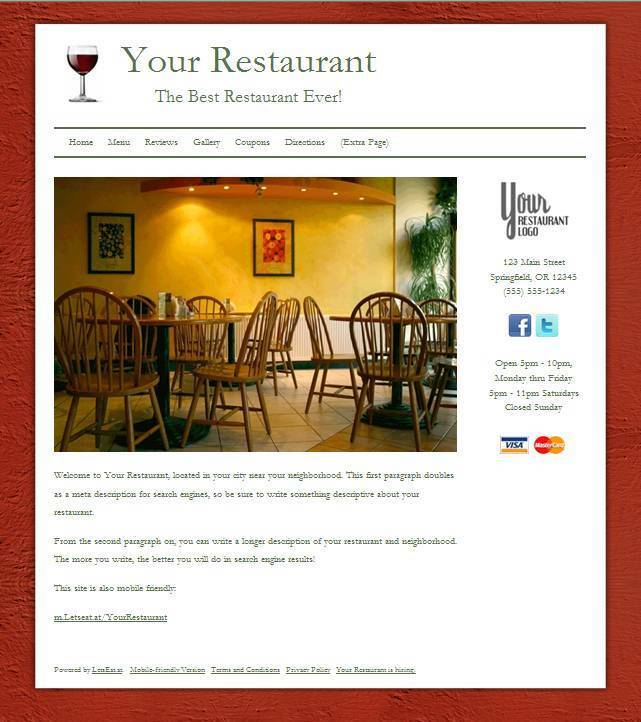 This Asian restaurant website theme features an elegant pair of chopsticks on a classic bamboo placemat backdrop. A bowl of rice–a popular feature of most Asian dishes–fills out the corner of this simple and classy web design. Great for Asian restaurants with takeout, dine-in and delivery. A big juicy hamburger sits atop the masthead of this hamburger restaurant website theme. What captures the classic American tradition of the burger joint and diner better than a juicy hamburger and fries? This rustic design is sure to impress your visitors. 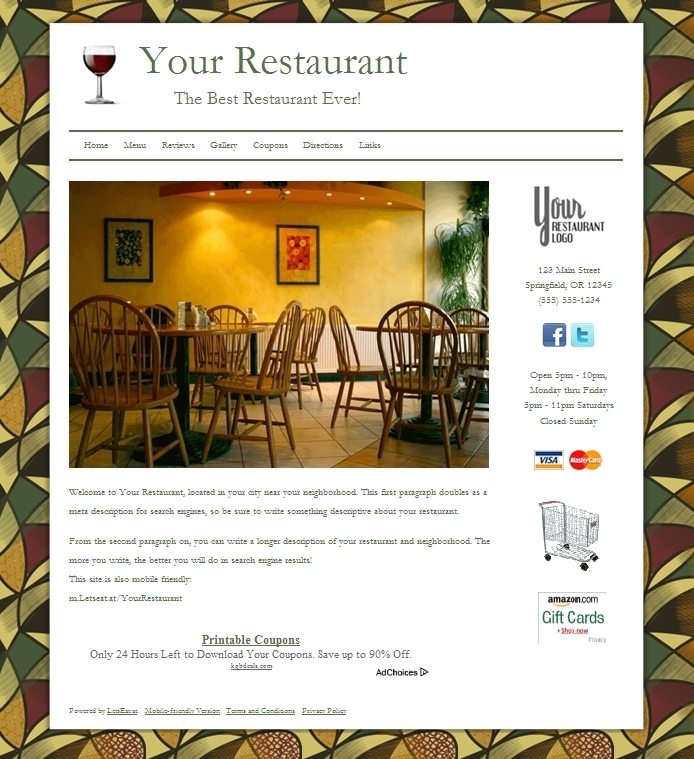 It's suitable for a cozy, old stylish family restaurant as well as fine dining. This bold red theme comes adorned with a bowl of hot steamed rice. Delicious! Wake up to a fresh cup of coffee with this classic coffee shop and café website theme. You can almost smell the coffee! This cutting board background, accented with a clove of garlic and a cutting knife is reminiscent of a good home-cooked meal. Pay tribute to the Taj with our regal Indian-themed restaurant website design. This Italian restaurant website theme features a delicious twirl of pasta and marinara on a colorful tablecloth backdrop. Spice things up with this Mexican restaurant website design. Our backgrounds perfectly complement the jalapeño. A mouth-watering pizza website design. Any pizza customer will be hooked once they see this site! Simple and elegant, this website design sizzles. You can almost hear the hissing and crackling of hot and freshly grilled steaks! This Japanese restaurant website design is garnished with a delicious pair of tuna nigiri. The photo gallery to the left features examples of other pages to the website. Click on the link supplied in the descriptions to enlarge each thumbnail. Earn up to 15% commission on sales generated from your own customized store, powered by Amazon.com, which will feature products relevant to your particular cuisine. Such as gourmet foods and groceries, cookbooks and DVDs, cookware, kitchen appliances, and books and DVDs about the country and culture of the mother country of your cuisine. Earn up to 15% commission on the sale of Amazon.com Gift Cards. Raves - a compilation of 3-5 star reviews by your customers. Click here for an example. FYI - a compilation of informative and entertaining videos and articles about your particular cuisine, as well as about the country and culture of its origin. Click here for an example. Resources Page - a directory of Link Partners (businesses that have exchanged links with you; helps increase your search engine website ranking). Click here for an example. Example with optional tile background.